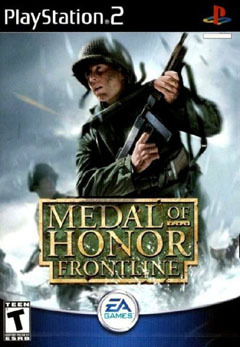 Medal of Honor Frontline is one of the most brilliant first person shooter's to hit the PS2 that makes you feel like you are the lead role of a World War II movie. "You Don't Play, you Volunteer." 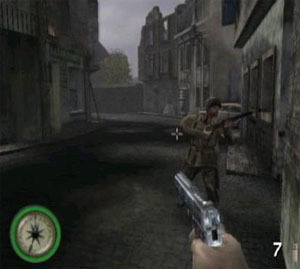 The Medal of Honor series originally started on the PlayStation, moved onto the PC and is now back on the powerful Playstation 2. Frontline is very similar to the successful Medal of Honor Allied Assault that was released on the PC earlier this year and contains the same awe inspiring storytelling and features of the PC version. I should make a note that this game is not the PC version but a brand new epic adventure set in the Medal of Honor World War II series. You play the role of Lieutenant James Patterson, a twenty-four year old solider of the Air Transport Corps who has found himself in the Lion's den. If your daring mission had succeeded, Operation Market Garden may have ended the war early. Even though your ultimate mission failed, you still have a duty towards the Allies. You must venture through hostile enemy territory and use your very wits to survive through stealth and sabotage. Your ultimate mission is to prevent the Nazi's from completing their jet bomber which may very well turn the war towards their favour. The first mission of Medal of Honor Frontline features a stunning recreation (Remember the first 30 minutes of Saving Private Ryan?) of the allied invasion of the Normandy, D-Day. As soon as the game starts, it throws you into the hostile world of war. Aboard the troop carrier, you soon realise that war isn't just about heroes and glory. The graphics of Frontline are truly amazing and you can look around at your troops and see the fear and bravery on each of their faces. It should be noted that all cinematics are ingame graphics which works very well with the game because of the awesome graphics engine. As soon as your transport arrives, your troops are soon cut down by Nazi gunfire and you must brave the cold waters as you look cover. This level shows how powerful the Medal of Honor Frontline engine is as there is so much action going on, its almost like watching a movie. Allied troops are running towards the beaches, the beach is littered with the dead and dying while the German troops sit comfortably in their bunkers. There are also German planes flying across the skies as they try to strafe you. If this level doesn't get your heart pumping than nothing will. As mentioned earlier, the graphics of Medal of Frontline are truly spectacular and are on par with the PC game MOH: Allied Assault. The uniforms, facial features and animations of all characters are perfectly done and you can actually see each character's emotions by the expressions on their face. There is a variety of death sequences, depending on where you shoot a character, for instance if you wound a character, they may look at their palms to see the blood, then collapse over. Frontline features a wide variety of amazingly well designed levels from Nazi occupied European towns to towns that have been bombed by the Allies. The framerate of Frontline is extremely constant but every now and then the game may chug a little because of the huge complexities of the levels. Medal of Honor Frontline is the equivalent of a Hollywood blockbuster movie. The gameplay of Frontline is extremely easy and you use your analog sticks to control your character, while using your shoulder pad buttons to fire and reload. 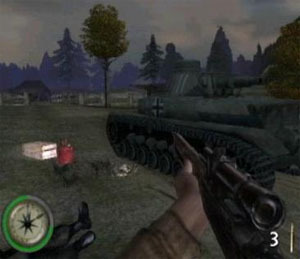 There are a wide variety of missions in Frontline such as disguising yourself as a Nazi officer or destroying a Nazi armoured train. The beauty of Frontline is that you will never get bored with the missions as they are all different. Combat can sometimes be tricky because you must get an accurate target on the enemy before you can successfully shoot them. The artificial intelligence of the enemies have been extremely well done, one wrong shot and you may have a squad of soldiers looking for you. If you increase the difficulty settings, then the AI becomes even more intelligent. There are a wide variety of authentic World War II weapons to choose from, such as the Springfield '03 Sniper Rifle to the powerful Bazooka rocket launcher. 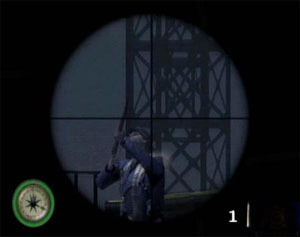 The game itself lasts between 15-20 hours, depending on how skilful you are as a first person shooter fan. Fortunately, once you complete certain levels, various secrets become unlocked which increase the gameplay value tremendously. Unfortunately with most console games, you can only save the game once you have completed a mission which may become frustrating if you are stuck on a huge level. There is a total of six missions in the game that contain four levels and you receive various medals on how well you complete a mission. Medal of Honor Frontline features some of the best audio to ever hit the PS2 and helps add to that Hollywood action movie feel. Once again, famed composer Michael Giacchino has returned to write some of the best orchestral music to date that really help set the atmosphere of the game. The sound effects of the game are top class and you hear everything, from authentic German accents to sniper bullets that ricochet pass your head. Medal of Honor Frontline is one of the best first person shooters on the PS2 at the moment and I highly recommend that you get this game. It contains amazing graphics, music, sound and gameplay that make Frontline a worthy purchase. Highly Recommended!